If you have your Windows user date format set differently from the other users of QuickBooks – I assume that it would work on some days and not others! At this particular client’s site, 2 users were using a mm/dd/yyyy date format, and the 3rd, the person who couldn’t make postings, was using dd/mm/yyyy. I was able to triage this to a Windows user issue, since other QuickBooks users using this fellows Windows login also were not able to make postings. It took a few tries while searching Google to find the magic search terms to confirm that I wasn’t the first to find this particular issue. It is 2015, I would have bet that a very common software package from a large firm would have had time to learn to convert dates to a single standard, maybe UTC, prior to applying business logic. 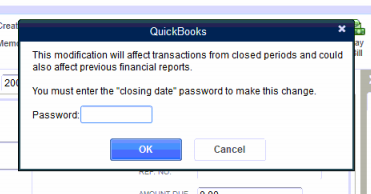 But… I would have lost that bet with QuickBooks.